Creation: VA 166 was created July 1933 as a renumbering of VA 504. It originally began at US 17 Deep Creek, then headed east on Cedar Rd to today's US 17, followed that across the Southern Branch Elizabeth River, then used Bainbridge Blvd north to VA 190. VA 166 then followed 190 through Great Bridge and ended at VA 165 Kempsville. This has been the only VA 166. Adjustments: In March 1956 (CTB), VA 166 was rerouted near Gilmerton to use Bainbridge Blvd north to South Norfolk, then zig-zagged over to Campostella Rd crossing into Norfolk. VA 166 continued as it does today out Princess Anne Rd to VA 165, then Northampton Blvd. At Diamond Springs Rd, VA 166 used Shell Rd and Pleasure House Rd to end at US 60 near Chesapeake Beach. In using this new route, VA 166 replaced VA 166Y; duplexed with US 460 into Norfolk; replaced VA 13Y on Princess Anne Rd; duplexed with US 13; replaced the other VA 13Y from Diamond Springs Rd to US 60. The old routing through Great Bridge to Kempsville became VA 190. About 1963, VA 166 was removed from Pleasure House Rd leaving behind SR 651 and instead was put on Northampton Blvd to meet US 60 a little further east. 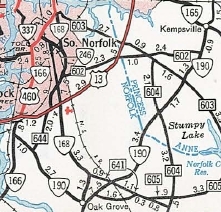 In Feb 1964 (CTB), VA 166 and US 13 swapped routings such that VA 166 followed Diamond Springs Rd to US 60, while most of VA 166's route to Chesapeake Beach became secondary as US 13 was placed on Northampton Blvd. In Aug 1965 (CTB), VA 166 south was truncated to Dominion Blvd. Cedar Rd became VA 165 while the road across S. Eliz River became VA 104 (now US 17). 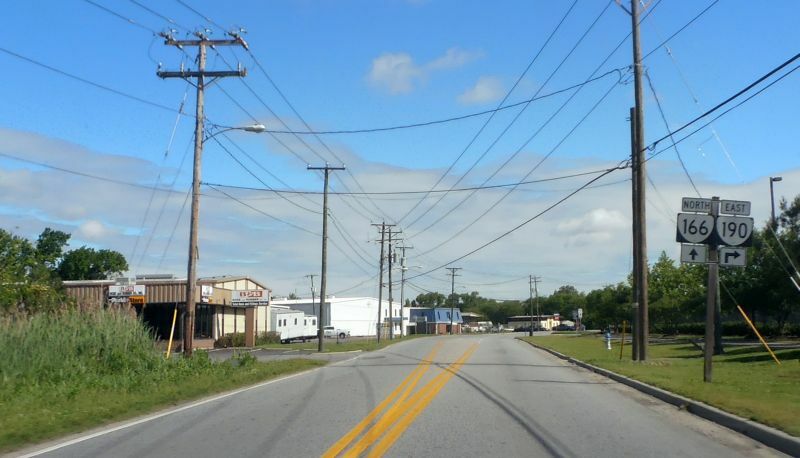 In 2014, VA 166's south end was moved to Dominion Blvd across from Dominion Lakes Blvd at a new interchange with US 17. The previous alignment down to US 17 near the Elizabeth River drawbridge is Bainbridge Point Rd. The first piece of VA 166 to be multilaned was when it was placed on Princess Anne Rd and Northampton Blvd in 1956. 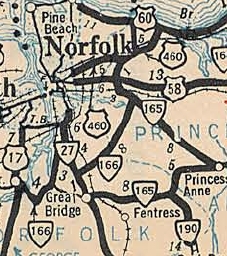 In 1960 or 1961, VA 166 was widened on its US 460 duplex north of the Elizabeth River in Norfolk. VA 166 became multilaned when it was placed on Diamond Springs Rd in 1964. 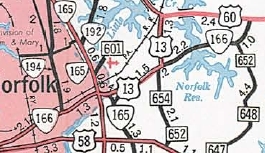 In 1990, VA 166 was widened from the Elizabeth River south to near VA 246. Posted: Fully posted in Chesapeake and Norfolk. Until recently there were no VA 166 shields in Virginia Beach. Now there is 1 - on Northampton Blvd announcing 166's left turn onto Diamond Springs Rd. Still no VA 166 postings at US 60. In a real oddity, there are VA 166 shields on both directions of Weslyan Dr at Diamond Springs Rd. This is well south of Northampton Blvd and has never been part of VA 166. This posting set-up has been in place back to at least 1992. VA 166 is not fully posted following US 460 in the zig-zag turns at VA 246. VA 166 is not mentioned from I-64 at the Northampton Blvd interchange even though VA 166 was there when I-64 opened. Comment: VA 166 is blown off by I-64 and I-464 in the City of Chesapeake. The Princess Anne Rd segment may still have some original concrete on it, as does Diamond Springs Rd.